The University of Regina IICSI site reports an exciting new year of research plans and projects. IICSI graduate student Jayden Pfiefer along with partners will be presenting open community drop-in theatre improvisation sessions as part of a year-long artistic residency in improvisation. IICSI researchers will be partnering with the Indigenous People's Health Research Centre (IPHRC) to document First Nations improvisation-based art and health initiatives in Saskatchewan, in order to start to understand the complex relationships between improvised cultural and artistic practices. IICSI and IPHRC researcher Jo-Ann Episkenew was also recently profiled in the local press for her lifetime of excellence in community-engaged research. Plans are also progressing for an interdisciplinary improvisation group to explore improvising across sound, music, dance, theatre and new technologies, in partnership with local dance company, New Dance Horizons. IICSI and IPHRC researcher Jo-Ann Episkenew. of those who participate in listening to or creating it? proposals and a short bio are due by March 15th, 2015. For full submission details, and to view the full call for papers, please click here. Christos Carras informs us that the Onassis Cultural Centre has now posted videos of the sessions of the Sounding Possibilities: Improvisation and Community Action Symposium that took place in Athens in November in collaboration with IICSI. Available in both Greek and English, the English versions can be viewed online here. 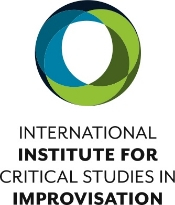 Critical Studies in Improvisation / Études critiques en improvisation (CSI-ÉCI) invites submissions for a special issue with the theme “Cultural, social, and political issues of current improvisation practices in music,” guest-edited by Postdoctoral Fellow Amandine Pras (Columbia University). We seek contributions from scholars whose interdisciplinary research lies at the intersection of music and life sciences disciplines (ethnology, anthropology, economics, politics, sociology, gender studies, cultural studies, psychology, among others). View the full call for papers here, and submit your proposal by March 1st. Improvisation in the Arts and Everyday Life: A Weekend of Performances, Dialogues, and Seminars will take place April 10-11, 2015 at Bowling Green State University, Bowling Green, Ohio. IICSI researcher George E. Lewis will deliver a keynote address and Curtis Goldstein is featured visual artist. There will be performances by Nicole Mitchell's Ice Crystal and Jon Cowherd's Mercy Project, and a roundtable discussion and seminars featuring Mitchell, Lewis and Wallace, as well as Danielle Goldman, Tammy Kernodle, Pete Williams, Edgar Landgraf, David Bixler, Olman Piedra, Lisa Gruenhagen, and former IICSI postdoctoral fellows, Tracy McMullen, Sara Ramshaw, and Mark Laver. 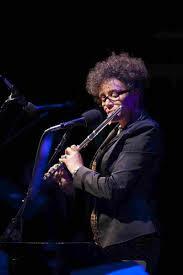 Nicole Mitchell will perform with her Ice Crystals at the Improvisation in the Arts and Everyday Life event to be held in April at Bowling Green State University. Somewhere There is staging its third annual Creative Music Festival at the Tranzac in Toronto February 20-22, 2015. It promises performances by more than 60 performers and composers doing important, boundary-pushing work. 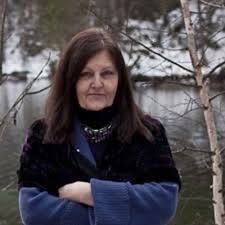 After an opening talk by Marie LeBlanc-Flanagan (Weird Canada) on Friday, performers will include Marilyn Lerner, Nicole Rampersaud, Brodie West, Tom Richards’ Riverrun, The Uplifters, Peripheral Vision, JunctQín Keyboard Collective, The Muted Note, Friendly Rich & The Lollipop People, and more. The festival program includes a prepared guitar workshop by Nilan Perera, and a talk by Canadian composer/improviser Allison Cameron. 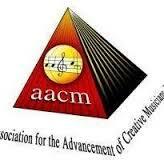 Preparations for the AACM's 50th Anniversary are Underway! Since 1965 Chicago’s Association for the Advancement of Creative Musicians (AACM) has been instrumental in the continuation of the tradition of creating original music with an influence that extends across the globe. In this respect, the AACM is preparing for a worldwide celebration of musical presentations, installations, exhibitions and more as the organization reaches a half century in 2015. This year long celebration will honor, reflect and advance the organization’s contributions to the world's musical landscape. 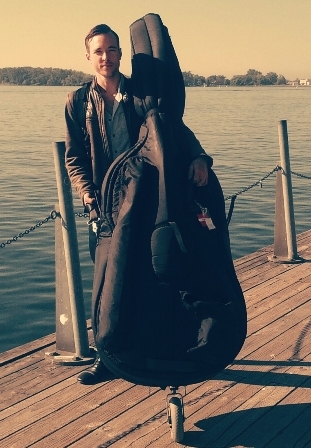 Montreal-based double bassist Aaron Lumley reports, “I am spending the winter and part of the spring in Europe: Amsterdam, Berlin, London, Hamburg. I am over here to study double bass and improvisation with three distinctly individual masters of the instrument—Wilbert de Joode, John Eckhardt and John Edwards—as well as to meet and make music with other improvisers in Europe.” Aaron’s European sojourn has been made possible by the Canada Council’s Grants to Professional Musicians program, which in recent years has also allowed improvisers such as David Braid, Josh Zubot, Tony Wilson, Dylan van der Schyff, Marilyn Lerner, Rainer Wiens, Gordon Allen, Kyle Brenders, Lori Freedman, Mark Segger and Heather Segger, to compose, collaborate, research, or study in ways that aid their professional artistic development. 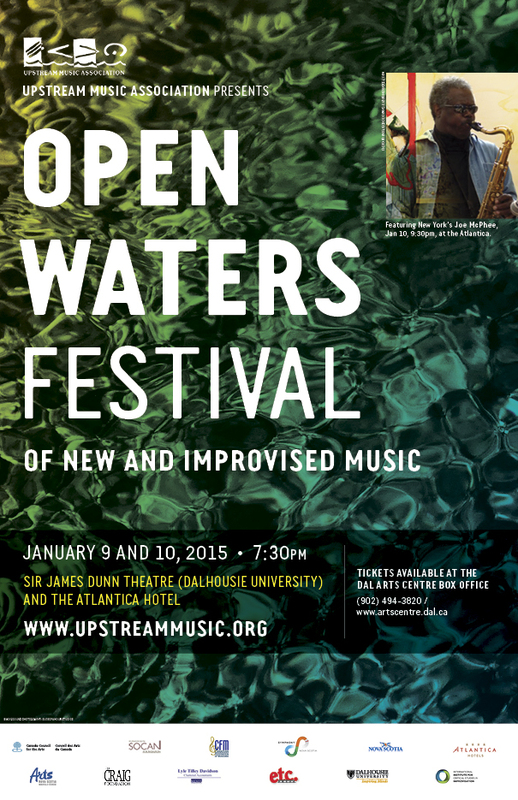 On January 9 and 10 in Halifax, the Upstream Music Association presented the Open Waters Festival of New and Improvised Music, featuring two days of creative ensembles mixing experimental, jazz and classical genres from Atlantic Canada as well as visiting artists from Quebec, Newfoundland and New York City. Bookended by Symphony Nova Scotia concerts with world premieres by Montreal's Tim Brady and Halifax's Jerome Blais, the festival was staged at the Dalhousie Arts Centre and the Atlantica Hotel. 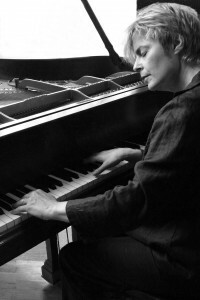 Featured were prepared pianist Tim Crofts, Norm Adams and Ellen Waterman (IICSI Memorial) in duo, the Subscription Opus duo of Chris Tonelli (IICSI Memorial) and Mack Furlong (interpreting the mail art scores of Jude Weirmeir), Steven Naylor and Jeff Reilly, the quartet Night Coast Music, the Dalhousie New Music Workshop, bassist Lukas Pearse, the Les Mécaniques de Nuit duo featuring James Southcott violin and Howard Beye viola, Joe McPhee as a special guest with the ensemble Free Delivery (Rick Waychesko, Dave Burton, Danny Martin and Paul Cram), duo Not the Music with Philippe Lauzier and Éric Normand, and Jamie Gatti’s Riot Squad with Chris Mitchell, Rick Waychesko, Geordie Haley and David Burton. Saturday afternoon featured an Improvisation Talk Back workshop, presented as a joint initiative of Upstream Music, the Guelph Jazz Festival and IICSI. Before last year completely fades from our overloaded memories, we should note that 2014 marked the 200th birthday of Antoine-Joseph "Adolphe" Sax. 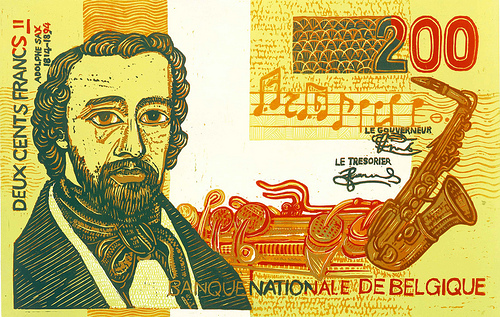 Adolphe Sax was a Belgian musical instrument maker and designer whose experiments with brass and reed instruments still resound throughout the musical world, notably with his most famous invention, the saxophone. Sax wanted to design an instrument that would fill the tonal area between the loudness of brass instruments and the facility of the quieter reeds and double reeds. In 1846 he filed his first patents for the saxophone. As the instrument became better known, it was widely used in military bands, and after World War I creative African American musicians began finding ways to extend the saxophone’s use into a new area of music that began to be called jazz. The day Bean grabbed his ax?" One of the problems with collective improvisation, as far as I’m concerned, is that people who use anarchy or collective improvisation will interpret that to mean, “Now I can kill you”; and I’m saying, wait a minute! OK, it’s true that in a free-thought zone, you can think of anything you want to think, but that was not the optimum state of what I had in mind when I said, let’s have freedom. I thought any transformational understanding of so-called freedom would imply that you would be free to find those disciplines that suited you, free to understand your own value systems; but not that you would just freak out because “the teacher’s not there.” The teacher is still there! Qtd. 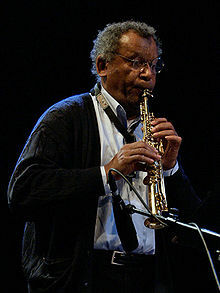 in Graham Lock, Forces in Motion: Anthony Braxton and the Meta-Reality of Creative Music (London: Quartet Books, 1988), 240.